From 1861 to 1865, a long and bitter civil war was fought in the United States of America. One of the major causes of the war was a dispute over the institution of slavery. After the pro-slavery Southern States were defeated, the institution was abolished throughout the U.S., Black people were formally emancipated, and three important amendments to the American Constitution were passed. The first of these, the thirteenth amendment, stated that “neither slavery nor involuntary servitude, except as a punishment for crime … shall exist within the United States.” The federal legislature (i.e., “Congress”) was given the power to enforce the article through “appropriate legislation.” The fourteenth amendment granted to all the “equal protection of laws” (among other things), and the fifteenth amendment prohibited the denial of the right to vote on account of race. … all persons within the jurisdiction of the United States shall be entitled to the full and equal enjoyment of the accommodations, advantages, facilities, and privileges of inns, public conveyances on land or water, theaters, and other places of public amusement. … any person who shall violate the foregoing section by denying to any citizen … the full enjoyment of any of the accommodations, advantages, facilities, or privileges in said section enumerated, or by aiding or inciting such denial, shall, for every such offense, forfeit and pay the sum of five hundred dollars to the person aggrieved thereby … and shall also …upon conviction shall be fined not less than five hundred nor more than one thousand dollars, or shall be imprisoned not less than thirty days nor more than one year. The Civil Rights Act of 1875 created what we now call “horizontal rights”: that is, rights enforceable against private parties. The law proceeded on the understanding that racism was more than just a function of State action, and was also deeply embedded within the social fabric. The subordination of black people, therefore, was not merely attributable to their formal status as slaves (now abolished). It was equally due to institutionally established conduct that systematically excluded them from mainstream economic and social life. And the only way this could be remedied was by putting constraints upon seemingly “private” expressions of racism, when they involved access to “public” spaces such as inns, modes of transport, places of entertainment, etc. We are familiar with a similar provision in the Indian Constitution: Article 15(2). The Civil Rights Act was challenged before the American Supreme Court. It was argued that the Federal Congress had no power to regulate the relationships between private individuals. The Fourteenth Amendment only protected individuals from abusive State power. In the absence of a State law or State action, therefore, the Fourteenth Amendment did not authorise Congress to pass a law such as the Civil Rights Act, which only dealt with private conduct. On the other hand, the Government argued that the Fourteenth Amendment was wide in scope, and permitted Congress to enforce its provisions through appropriate legislation. The Government also argued that the denial of civil rights was an inseparable element of slavery and involuntary servitude; consequently, the law was justified under the Thirteenth Amendment as well. For the Majority, therefore, the word “slavery” was a very specific term with a specific content (born out of historical experience), and its scope could not be stretched beyond that historically-determined content, to include adjusting the “social rights of men and races.” Only the “incidents” of slavery – its “substance” and “visible form” – were made subject to legal prohibition. Denial of civil rights by private parties did not constitute an “incident” of slavery. Between the Majority and the Dissent, therefore, there was a fundamental interpretive disagreement. The Majority believed that words such as “slavery” and “involuntary servitude” had clear and sharply-defined boundaries, determined a priori. These boundaries were fixed by the manner in which the words were been generally used, and by the range of elements that they had been historically believed to have referred to – on one specific and constrained reading of history. Slavery, therefore, was “slavery” – the institution under which one set of human beings was treated as the property of another, and was denied legal freedom. Once that institution was abolished, there was no further role for the Thirteenth Amendment to play. Harlan J., however, thought otherwise. As he began his dissent by noting, “it is not the words of the law, but the internal sense of it that makes the law; the letter of the law is the body; the sense and reason of the law is the soul.” This may sound hyperbolic and manipulable, but as Harlan J.’s analysis showed, it is anything but. As Granville Austin would note many years later about the Indian Constitution, Harlan J. believed that “fundamental rights were framed in the backdrop of fundamental wrongs.” To understand the scope of fundamental rights, therefore, you had to first ask yourself: what were the fundamental wrongs that a Constitution intended to redress and to transform? This required a broad interpretive horizon, and a deeper historical vision. So where the Majority saw only the legal institution of slavery, Harlan J. saw the conceptions of racial superiority and inferiority that constituted the foundations of that institution. Therefore, while the Thirteenth Amendment used the word “slavery” in order to highlight the primacy of that institution to the Constitution’s transformative vision, and its unmatched moral horror, it also included – by implication – the acts, practices, and institutions of racial superiority and inferiority that formed the warp and the woof of the fabric into which slavery was sewn. And one such practice – integral to the institution of racism – was the denial and exclusion of people, on the basis of race, by those who owned and controlled those public spaces. 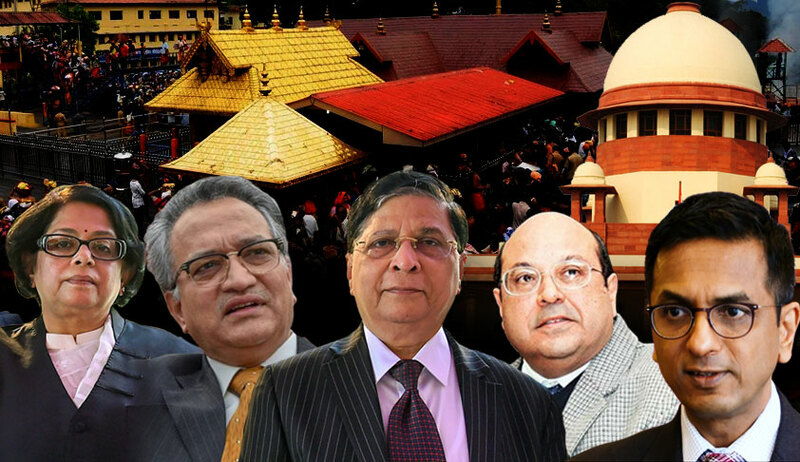 The Supreme Court’s Sabarimala judgment has been heavily debated. Here, I don’t want to re-litigate the multiple contentious points in the judgment, but focus only on one issue: the constitutional disagreement between Chandrachud J. (concurring) and Malhotra J. (dissenting) on the interpretation of Article 17 of the Constitution. This issue was argued in some detail before the Court, but the majority opinions of the Chief Justice and Nariman J. did not consider it. Both Chandrachud J. and Malhotra J. did consider it, however, and as I shall argue, their disagreement bears a striking parallel with the constitutional debate at the foundation of the Civil Rights Cases. Article 17 of the Constitution prohibits “untouchability” and its practice “in any form.” The question in Sabarimala was whether the exclusion of women between the ages of ten and fifty from the Sabarimala Temple fell within the scope of Article 17. For the purpose of this essay, I am going to bracket the factual debate over whether the prohibition flowed from the fact that the ten-to-fifty age-group was a proxy for menstruating women, or whether it was to do with the brahmachari character of Lord Ayappa. Whatever the origins, the fact is that menstruation was argued as one of the two reasons in Court (as well as set out in an affidavit), and the Court was therefore obliged to examine it. Consequently, putting aside for the moment the specific facts of Sabarimala, let us consider how the two judges analysed the relationship between menstruation-based exclusion and Article 17. For Malhotra J., the issue was straightforward. Article 17 was intended to prohibit caste-based untouchability. It was an expression of the framers’ revulsion at the most horrific social practice in India, an acknowledgment of the immense suffering that it had caused for centuries, and a promise to make amends. “Untouchability” was a concrete word, with concrete, historically determined content. It could not be extended to include any other form of social exclusion. In other words, like slavery was the most horrific and most tangible manifestation of racial hierarchy, untouchability was the most horrific and most tangible manifestation of an exclusionary social order that was grounded in ideas of purity and pollution. There were, however, other manifestations of that order as well. In the case of slavery, it involved exclusion from public spaces, even to the formally “free”. In the case of menstruation, it involved exclusion from public spaces on the ground of the impurity of a biological characteristic predominantly associated with women. According to a 2016 analysis conducted by the Tata Institute of Social Sciences (TISS), only one in eight girls surveyed faced no restrictions at all during their periods. Published in the British Medical Journal, the analysis used data collected from 138 studies and more than 97,000 adolescent Indian girls between 2000 and 2015. Further, 8 in 10 girls surveyed said they aren’t allowed to enter religious shrines when they are menstruating; 5 in 10 girls said they were not allowed to touch people or food in the kitchen; and 2 in 10 said they were asked to sleep in a separate room. This is not to suggest for one moment that menstrual taboos are equivalent to caste-based untouchabiliy, or that Article 17 of the Constitution accords equivalent concern to the two. The point, however, is this: just like untouchability is at the centre of – and the most savage and vicious embodiment of – a structure of hierarchy, subordination, and violence, menstrual taboos are embodiments of patriarchal institutions that have been historically responsible for the subordination of women; and at the heart of both – caste and patriarchy – are concepts of purity and pollution. It was this insight that was grasped by Chandrachud J. when he held that social exclusion based on menstrual taboos falls within the scope of Article 17 (a conclusion that he buttressed by extensive references to the Constituent Assembly Debates, where a number of framers believed that by adding the words “in any form” to Article 17, they were striking at the root of all forms of social exclusion based in structures of hierarchy and subordination, without taking away from the centrality of caste-based untouchability). And the similarity with Harlan J.’ s dissent should now be clear: Like Harlan J., Chandrachud J.’s enquiry began with the question of what kinds of injustices the Constitution intended to transform. The meaning and scope of the words of Part III would flow from the answer to that question. Like poets, judges too are in silent conversation with each other, across the gulfs of time and space. Slavery was the so-called “original sin” of the American State’s founding, and it was the one social institution that the framers of the Reconstruction Amendments decided to abolish directly by Constitutional fiat, rather than leave it to legislation. Perhaps unsurprisingly, it was the interpretation of that word that caused one of the most memorable debates in American constitutional history, and one of the most famous dissents of the American Supreme Court. Similarly, it was untouchability that our framers decided was fundamental enough to be prohibited directly by our constitutional order; and in 2018, it is a debate over the interpretation of that word that has brought to the fore two different visions about how to read the Constitution, and more fundamentally, what the Constitution is for. If Harlan J. did send his soul through time and space, he would – perhaps – be content by the manner in which the conversation has now been carried forward by the Indian Supreme Court in 2018.